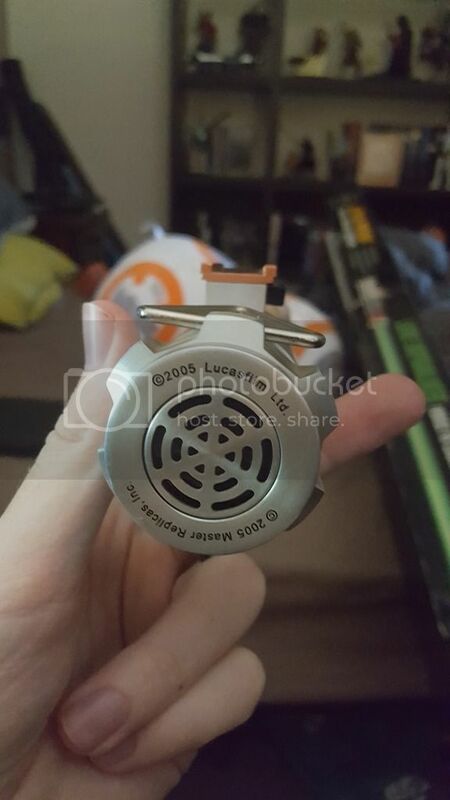 Recently received a 2005 Luke Skywalker Return of the Jedi Lightsaber (Master Replicas) for christmas however... on the hilt where there should be a black inlay as on the box it is a gold/copper/bronze colour instead. Looking at it it looks 100% legit, not faded or repainted. Im wondering if there was another version of this that was released with small alteration? I honestly have no idea what I have. 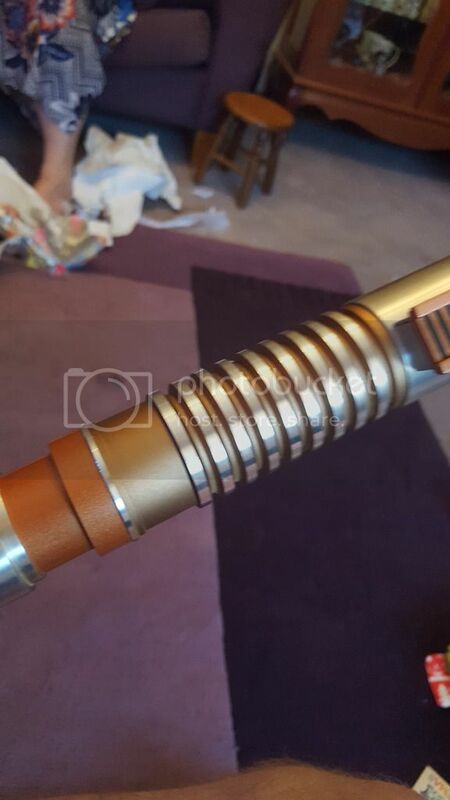 All i know is that the colouring is wrong but on the saber itself it looks like it was produced that way. I've seen quite a few of those over the years, and I can safely say I've never seen one like that...that is most likely a re-paint by a former owner. It's actually not that difficult to do and make look like it was the original paint color. was it displayed in full sunlight? The blade looks like its faded but the hilt looks perfect the whole way round. 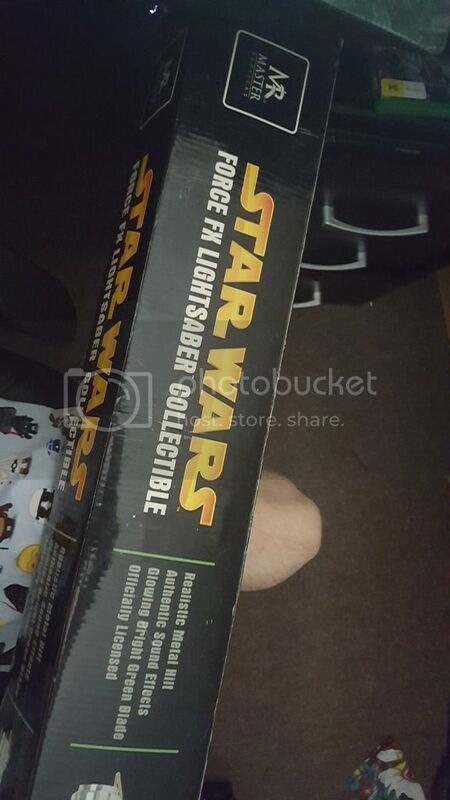 I'm not sure how it was displayed but the previous owner had heaps of other sabers, hence why I'm so confused. I don't think it's a repaint. it looks like the factory finish, has somehow shifted from black to brown. the most likely culprit is sunlight.. but the culprit could also be simply "time". 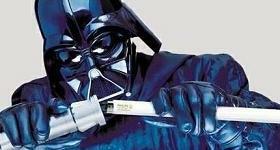 example: luke ESB -- the rubber grips are not rubber. the rubber grips are actually hard plastic, which has been 'sprayed' with a rubber-feel coating, which just happens to be, chemically unstable. the rubberized coating on the grips WILL decompose over time and turn to sticky black goo. the only solution is to clean that gunk off with alcohol, and bring the grips back to 'hard plastic'. WHY they did this? I'll never know. I can't imagine they saved a lot of money by cutting this corner. if they had simply used real 'rubber' to make the grips, then these sabers would have a near-infinite shelf life. but the way they were made, these things are ticking time bombs. 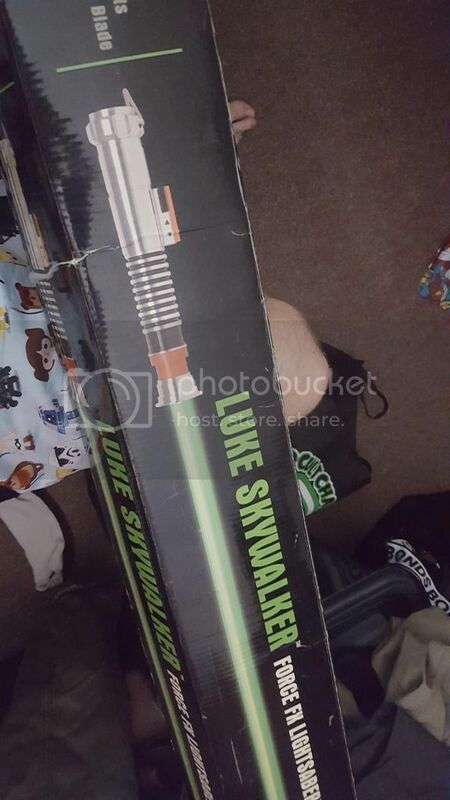 I gave one last year as a christmas gift to a family member -- (packaged in 2004, opened for the first time in 2016) -- he opened the "mint in sealed box", and the grips on his collectible saber were sticky black goo. the only culprit was "time".